The term Vedanta refers, first, to the Upanishads, those teachings which stand at the “end of the Veda.” But these teachings also stand at the beginning of India’s traditions of philosophical reflection. There are several systems of philosophy, called darshanas or “viewpoints.” One of them, the most influential, is known specifically as Vedanta. Among its most famous advocates is the philosopher Shankara (c. eighth century CE). The Upanishads ask, “What is the foundation of all that is?” “What is the nature of the soul?” “What is the relation of this soul to that foundation?” Shankara asserts the identity, or at least “non-duality” of Brahman, the foundational reality, and Atman, the soul. The phenomenal universe, he says, is related to the oneness of this Reality as waves are manifest in the sea. According to Vedanta, however, the real “answers” to these kinds of questions require not simply book-learning, but deep insight. This insight is called jnana. It is revolutionary wisdom, turning one’s consciousness toward Brahman. It is enlightening, transforming wisdom. This alone, they say, is the gateway to the spiritual freedom that is called moksha, liberation. Wisdom is difficult to acquire on one’s own. It is the teacher, the guru, who guides one along the spiritual path. The teachings of the Upanishads were never intended to be published for anyone to buy. And they were not meant to be read in the library or at home in the living room. These teachings were meant to be studied only in the context of a life of serious spiritual discipline, only by those properly prepared, and only with a qualified teacher. The Prashna Upanishad tells the story of six eager students who approach a guru for study. But before he would take a single question, the teacher required them to live with him for a year, leading a life of discipline, to see if they were fit to be taught. From ancient times to the present, the guru has played an important role in transmitting the Hindu traditions of wisdom and practice. The guru receives credentials from his or her own guru, and thus from the guru’s teaching-lineage. The guru gives his or her students initiation or diksha into the spiritual practice of that tradition. This may included giving a mantra: a name, phrase, or word that is to be used in meditation practice, and that will guide one’s spiritual practice. The guru has a more general role as well, often serving as a counselor on questions of health, family, and marriage. The guru, especially as a teacher and spiritual preceptor, is also called a swami. The teachings of Vedanta came to the West with Swami Vivekananda in the late 19th century. He established the first of the Vedanta Societies which exist in many American cities today. 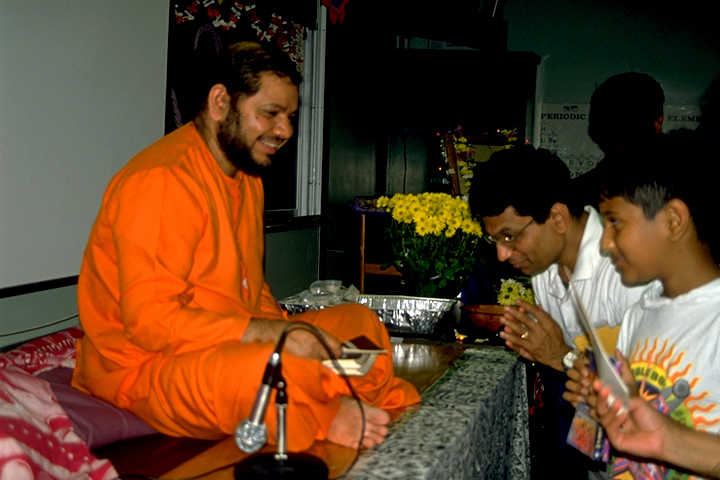 In the 1970s, teachers such as Swami Chinmayananda and Swami Tejomayananda of the Chinmaya Mission and Swami Dayananda and Swami Viditatmananda of Arsha Vidya Gurukulam in Pennsylvania were popular teachers of the Vedanta tradition in North America.